Welcome to MinuteTennis.com! 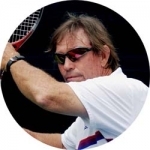 I’m Mike VanZutphen and I’ve spent over 30 years of my life teaching tennis and instructional tennis program management. My techniques and teaching materials are like no other available. Try my products. I guarantee you’ll love what you learn, or your money back. the High Performance Coaching Manual. 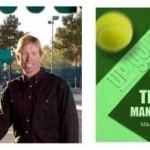 The best professional coaching manual available – designed specifically to meet the needs of tennis coaches who are training players at any level – junior to tour pros. 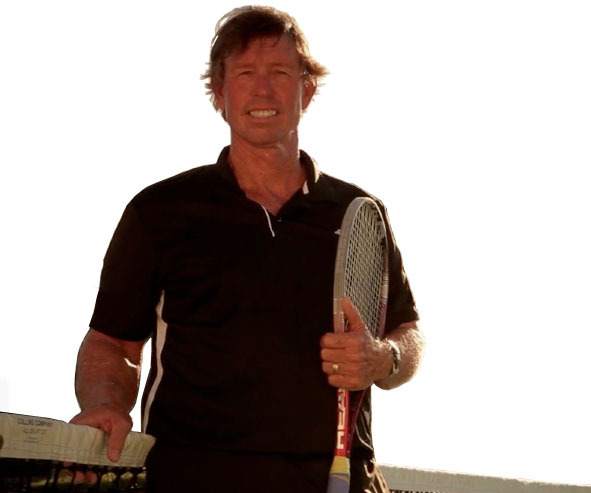 Follow my time-tested approach to tennis coaching and you’re guaranteed to see results. 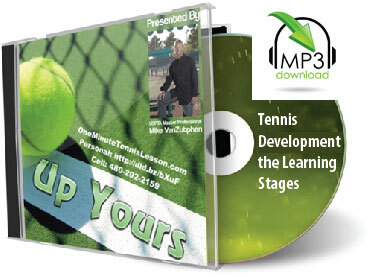 Improve your Tennis Game with my Instructional CDs, Downloadable Audio Training, and Books! My training methods have helped some of the worlds best professional tennis players as well as beginners and recreational players alike. Starting with the right fundamentals is key for beginners, while advanced methods and techniques are guaranteed to help experienced players. My training tools will make a difference in your game. 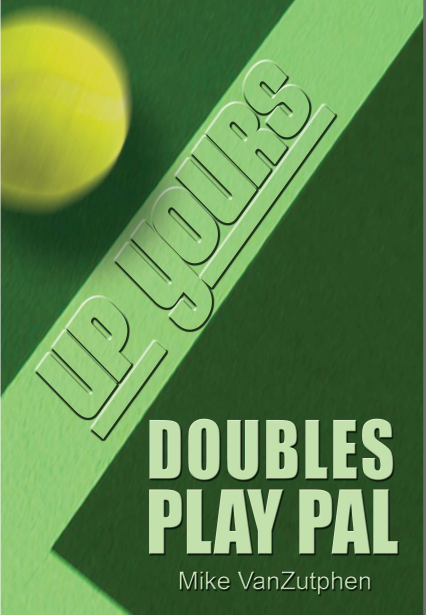 The Doubles Play Pal is like having a coach in your bag. Simple and easy-to-follow instruction will help diagnose problems in your game and help you win more matches. $10.00. 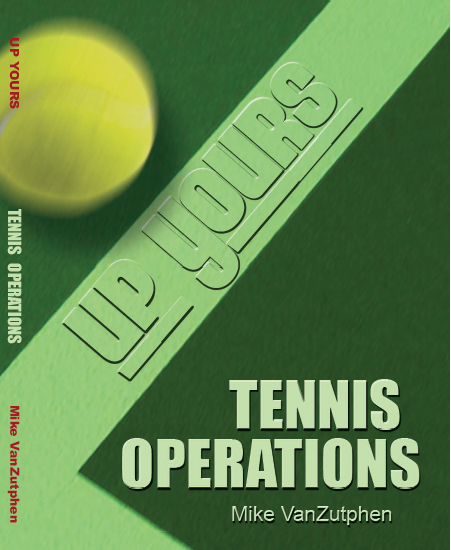 My newly released Tennis Operations book is designed to provide the tennis management or club director with the knowledge and tools to run your tennis center. From private or public Tennis Clubs to resort Tennis Centers, this book is guaranteed to improve your ability to operate any type of tennis business. $49.95. This audio download, or CD explains the corrective Characteristics for the beginner, intermediate, and advance players. The cognitive, associative and autonomous stages and learning styles to help the professional or recreational player understand how we learn. It is the analysis of development of fine and gross motor skills in the long range enhancement relative to practice and experience.$24.95 value – now $19.95! 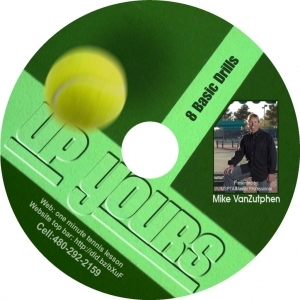 This CD covers basics in tennis for the beginner to advance player and audio understanding of how to use the court and be wise about match play. Understand the importance of footwork and why your not playing as well as you could. This CD Audio disk will have you hitting more confident shots just by following my key footwork techniques. Stop wasting time in your training sessions. These 8 basic drills will give you the fundamentals to the best use of training time and improve your game dramatically. The ultimate guide to improving your game the best way possible – through a systematic plan and tried-and-true methods. 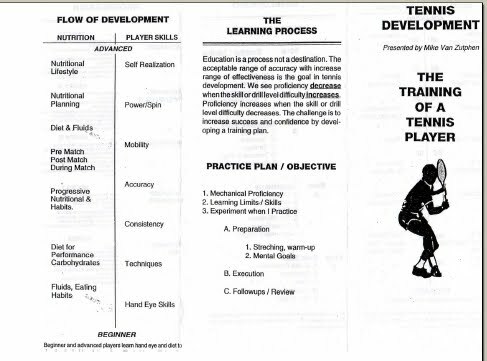 The method covers key areas of development, including conditioning and match play. Use the built-in tracking of skills to chart your way to success. Track yourself and customize your individual goals – on your schedule. Find answers that will lead you to better play. A plan is the only real way to achieve success. Follow my plan and you will see results. A must-have for any tennis Pro studying for the USPTA test. Learn the testing requirements with my specific descriptions and pictures that show exactly how to teach grip technique. Learn the advantages of different grips and the hand positions with descriptions and pictures to understand how to hold the racket and – most importantly – why. 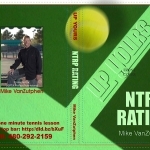 This book is not only for the Professional taking the USPTA test but the recreational player who wants to know how to hold the racket properly. Improve your club’s operations. Understand why your tennis center is under performing. This book helps a new or experienced club managers analyze the challenges of club operations and fix problems. I’ll walk you through the steps to improve your tennis center starting with the all-important Operations Audit. Learn from my 30 years of operational experience through real-world examples. As an added bonus my employee handbook template is included at no additional cost. This Gold Standard operations book is the only one of it’s kind. But for a limited time I’m offering it for just $199 – a savings of $100 over retail price. This audio CD Disk covers how to identify the challenges in the operation from the physical plant, maintenance, equipment, aesthetics of the facility. The weakness in member services, staff, communication, promotion and operation of the club. It is the way to understand where to start on the development of the club. Used on my tour professionals, this same learning standard is a must-have for advanced players and advancing junior players. Using my Tennis Management Instructional method (TMI) you will improve your match play. Track the skills used to improve on-court performance on your individual schedule. This book is the formula for success. Stop wasting your time with random development. Build the plan that will ultimately lead to success. From diet and conditioning to personal goals and tennis psychology this book will lead you to your best game. This audio download or CD covers the categories and priorities of development along with the specificity of training for the individual. It covers overload vs work schedule with progressions vs regularity and recovery with periodization. Evaluation with action plans for pre-competition and post competition stages. The goal is to understand a practice plan for the individual based on the goals and timeline for development. 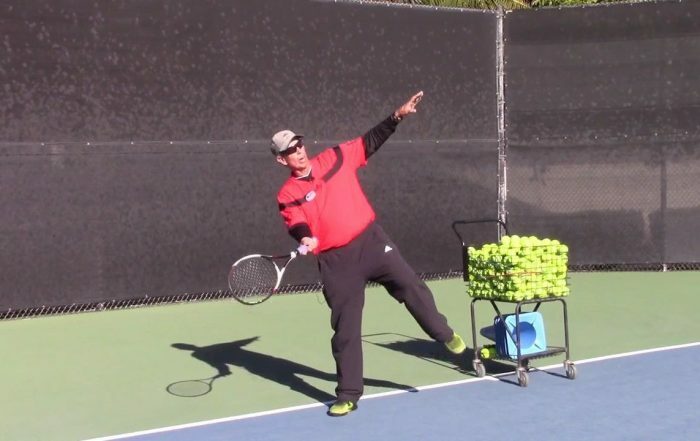 The MinuteTennis.com eMagazine covers many of the key tennis training lessons covered in my weekly clinics. Sign up today to receive weekly tips, strategies and techniques, guaranteed to Up Your Game. Do you make these mistakes with your forehand? Mike Van Zutphen2017-09-07T16:32:16+00:00February 2nd, 2017|Comments Off on Do you make these mistakes with your forehand? I’ve connected with so many players over the years. Here’s what just a few have to say. 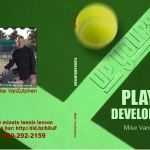 I’ve trained with a number of coaches over the years and Mike Van Zutphen is by far the best. When I was stuck in my game and not improving he helped where 3 other coaches were not able to. After making progress on my mechanical issues, Mike has now helped me progress my game further than ever. His strategy classes and training methods are eye-opening, and unlike any other I’ve found in my history of playing tennis. I would encourage any player, work with Mike for doubles strategy, techniques and methods, fundamentals for both beginning players, intermediate and advanced. You really have no idea what you’re doing wrong or what you need to do to win more and play better, until you experience his training. Tennis Players – on the court and through my online training tools, audio cd’s, videos & books. My private lessons and group clinics focus on techniques, strategies and tactics. Call today to schedule a lesson. Most doubles players have no idea, or the wrong idea why they lose. My training helps you understand things like player recognition, court position, appropriate responses, and tactics to improve your game.. I've helped over 1,000 professional tennis coaches. Most coaches follow the same models that have been considered “standard” for years. But great coaching comes from an ability to help tennis players improve technique and strategy. Let me help you become the best coach you can be. Professional Club Management requires special knowledge and experience. A great club manager has a positive impact on its memebers and the business. My methodical approach to professional club management comes from years of experience. Learn from my tools and resources how to improve your club operations, increase membership and member satisfaction while improving the bottom line. 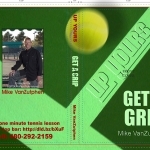 Welcome to MinuteTennis.com a Mike VanZutphen company. The material and content presented on this website are intended for the tennis professional manager, tennis coach, as well as players of all levels.